I was born in the actors’ family. 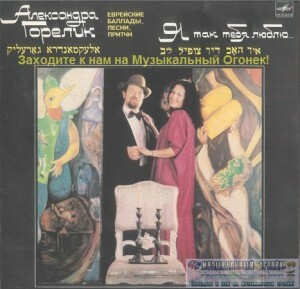 My father, Alexander Gorelik, was a soloist singer of the Moscow Operetta House. My grandmother Shura was an actress, the performer of ballads. My sister Natali Gorelik-Olenina is a soloist singer of Moscow Music Theatre. I am freezing with horror thinking that Yiddish has died in these East European shtetls and was killed in WW2. Yiddish is a part of the great Jewish culture its musical speck I keep and care about. The priceless collection I inherited is not a dried herbal but a mystical immortality of my nation. There were many zigzags of fate. Our family moved from town to town from theatre to theatre and I kept changing schools leaving my friends behind. Once in Moscow I was going to the Children Cinema Festival for I was presented a round ticket for my “batmitzva”. I stumbled on the escalator step in metro and fell directly into Vittorio Desica’s hands. He was shooting the final episode of his greatest masterpiece “Sunflower”. He took me for a short role in this episode. I rushed home screaming “I am not going to be a Ballet dancer I’ll be an actress”. Since then I have not stopped on my way. I picked up singing as my little theatre. Studying at the Moscow Maly theatre school, acting at Moscow Jewish Theatre skipped away. I had been drawing, singing songs acting in many plays. There was a success and frustrations the common followers of an actor. I had recovered my Jewish identity and realized myself as a part of great nation. It gave me self confidence and understanding how to express myself. I bore my dearest son and then created a concert of Yiddish songs since then I have been speaking my mother tongue, the tongue of my soul. I recorded my first single in Yiddish I LOVE YOU SO… in 1988 than I released the second single BELTZ ONE MORE TIME. But this single vanished in Perestoroika turmoil. Since than I recorded disks in Check Republic and Israel those are DON’T CRY BOY and A VIELT A ROSE being sold all over the world. Besides Yiddish songs I released disks with the songs of the world best performers and my own songs. Just recently after my return from the concert tour round Europe I released a disk with the songs in several languages English, French, Spanish, Yiddish every possible language where my Jewish viewers could be. While in Soviet Union I went on the concert tour in Argentina, USA, Canada, performed with Orchestra of Felix Slovachek in Check Republic, released two singles in Yiddish and Hebrew, left the theatre and run my sole career and never felt sorry of what I had done. Having repatriated to Israel I came closer to my Jewish backgrounds. Here I met my Yiddish teacher who wrote me new songs and translated songs by L.Torres, Chardash Monti, Danube Waves all the songs coming from our previous life. Yiddish song is my destiny. It is a pity that Yiddish has not got the recognition as a second state language in Israel. It is understandable that first Zionist had to ressurect the Hebrew. Great accomplishments require “little” sacrifices..
New Israeli generations do not know Yiddish as a language and lost all ties with the culture of Exile. It is great that songs in Yiddish are so popular beyond Israel. Yiddish is a language of exile, language of thorough. Yiddish is a language of my joy and love. This culture is alive to many people in the world. My songs in Yiddish will find a lively respond in your Jewish souls. You are welcome to my concerts. Find yourselves as a piece of Jewish World. Keep your gin memory alive…don’t let it down.